This snow globe is da bomb. When I’m digging through a bin of costume jewelry at a thrift shop or yard sale, I don’t expect to find a tiny bomb among the rubble of rhinestones, silvertone seagulls and tarnished beads. But just like in real life, you never really know what’s around the corner, or lurking under those authentic “made in China” pukka shells. We don’t suspect a “bombshell” before it’s dropped in casual conversation. We don’t expect to go from digging for diamonds to dealing with destruction in a flash. So this bomb is front and center in a snow globe, touched with a shimmer of dark dust, and surrounded by what may be harmless shapes: towers and cones and flying saucers, planets and satellites. The shape of the bomb is seductive, its pose is alert but inert. For now. Do you prefer danger to be out of sight and out of mind, or to be hidden in plain view? 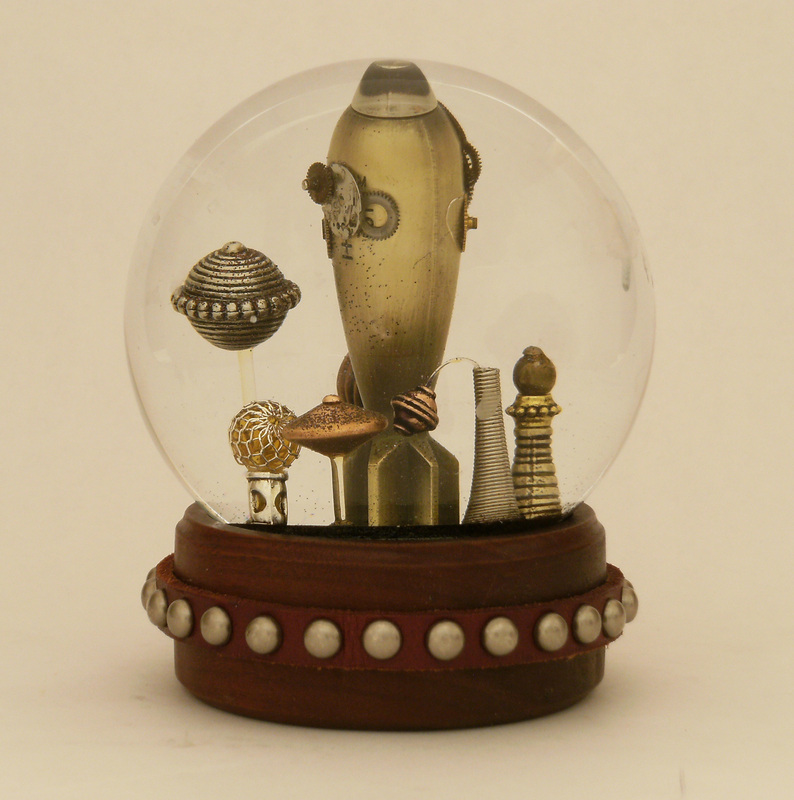 This entry was tagged artisan snow globe, black snowstorm, miniature sculpture, one of a kind snowglobe, Science Fiction snow globe, science fiction waterglobe, scyfy waterglobe, spaceship waterglobe, steampunk bomb, steampunk waterball. Bookmark the permalink.